New difficulty modes will be added too. 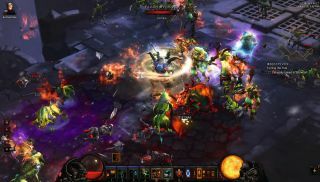 Blizzard offered its preliminary patch notes for version 2.4.2 of Diablo over a month ago, and while that still hasn't made its way into the game proper, it's "coming soon", according to a new blog post that goes into the patch in more detail. You'll remember, of course, that 2.4.2 adds a hotkey to hide the UI, letting you better appreciate the environment, and maybe build a photo journal of your adventures through Diablo 3's miserable world. Hey, I'd look at that. But the meat of the update will surely be the new difficulty levels. Rather than stopping at X, Torment mode will soon go up to XIII, with better loot, and gold and XP bonuses rewarding players ready to take on the greater challenges. There will naturally also be new treasure and so on across the board, the most substantial change being that Blizzard is "sweetening Adventure Mode rewards, starting with Nephalem Rifts. You’re now guaranteed a Greater Rift Key when completing any Rift, with a chance to get a second (or even a third) key as you increase the game’s difficulty". The developer has "also adjusted drop rates for Infernal Machines, with a 100% drop chance in Torment IV, and an increasing chance for a second machine to drop as you go up in difficulty".